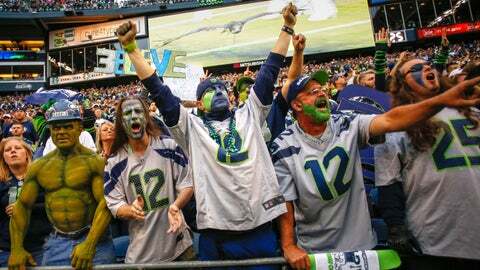 Seattle's 12th Man has a plan for Sunday's game in San Francisco. Don’t know if you’ve heard about this or not, but Seattle Seahawks fans are loud. They set another noise record during Monday’s win over the Saints and they also caused an earthquake during the game. That’s great and all but their team is playing on the road this week against the rival San Francisco 49ers. So how will they make their presence known in San Francisco? Well, some of them have hatched/funded a plan to fly a "Go Hawks" banner over Candlestick Park right before kickoff. A group consisting of 100 contributors have pooled together $1,809 to fly the banner that will read, "GO HAWKS-12" for 15 minutes. The airplane towing the banner is expected to reach Candlestick Park 10 minutes prior to kickoff of the Seahawks-49ers game. Seahawks fans Cedric James Morris and Travis Platt created a FundRazr account to come up with the resources and already have made $509 more than their initial goal. The group says it will donate the extra funds to Wounded Warrior Project. Many of us can’t make to Candlestick park to support our Seahawks on Dec. 8th when they play the 49ers. To show our dedication and support as members of the 12th man Travis Platt and I (Cedric James Morris) propose that we fly a plane with a banner attached that reads "GO HAWKS-12" over the staduim 10 minutes before kickoff not just showing San Francicso, but the entire nation that we are the most passionate, the greatest, and the LOUDEST fans in the NFL. The banner would fly for approximately 10 to 15 minutes above Candle Stick!!! The amount total is exact to the dollar of the price for this task to happen, and the pilot has a no fly guarantee. If for any reason conditions are not suitable to fly, our money will be returned, and every individual that contributes will get any contributions back via paypal. Let’s show the world, and those 49er’s what the 12th Man is all about. ARE U FIRED UP? Let’s make this happen my fellow 12’s. As you all know we have a surplus of funds, so that surplus will go to our favorite charity, the Wounded Warrior Project. If you still want to contribute to the banner, you can. Just see it as a percent of everyone’s contribution will go to the WWP charity. Currently 20% is going to WWP. Below you can see our WWP page that our very own Jonathon Ellington set up for us. We’re guessing the 49ers won’t be rattled by this. They might, however, be rattled by the 11-1 Seahawks who beat them rather easily in Week 2.